"...Leading off with a couple of originals ("Discovering Your Secrets," "The First Day Of Love") set the stage for forty minutes of relaxing, light jazz from the tender touches of a pianist who prefers the warmth of lovely music to the heat of a swinging affair. His renditions of Porter's "Easy To Love" and Monk's classic "Ruby My Dear" are delicate intimate statements, while his own "July Bossa" provides a brief glimpse of his quick right hand approach. A musician with a preference for the softer side of jazz, pianist Norberto Tamburrino offers a break from the boisterous horns and saxophones, and the pounding sounds of the percussive instruments, with a masterful solo piano performance of Lovely Tunes that is truly a pleasure to hear often.."
"...quello che colpisce della sua musica e' il non essere affatto appiatita su Monk; tra l'altro, si potrebbero nominare altre ascendenze, come Tristano, il primissimo Bley, Ran Blake, perfino Tatum e cosi' via. L'orbita' monkiana e' forte, ma solo su certe coordinate: il senso del pianoforte come strumento percussivo, l'assenza delle mezze tinte (cosa che rende davvero inconsueta la sua drammatica versione di Estate), il gusto dell'iterazione e della dissonanza..."
Ancora una prova superlativa del pianista Norberto Tamburrino che attraverso undici brani evidenzia tutta la maestria di un pianismo basato su una solida preparazione di base e su una profonda conoscenza della letteratura pianistica. “Revelations from the Sky”, Art Notes. Come nei precedenti album, il grosso del repertorio (8 brani) è costituito da originals di Norberto con l’aggiunta di “Estate” di Bruno Martino, “Body & soul” e “Nutty” di Thelonious Monk. Tamburrino affronta, quindi, ogni brano con lo giusto spirito: così in “Estate” e in “Body & Soul” dà prova allo stesso tempo di grande lirismo e di originalità mentre il pezzo di Monk è l’ennesima testimonianza dell’amore che Tamburrino nutre verso questo grande maestro. Ma a conferma che il pianista conosce , come si diceva, assai bene tutta la storia del piano jazz, nei due brani che assieme a “Body & Soul” chiudono l’album, vale a dire “2010 Itinerary” e “Free Impro” scopriamo un Tamburrino quasi inedito lanciarsi in improvvisazioni di chiaro sapore free, ma un free consapevole, maturo, in cui si sa perfettamente cosa si sta facendo in ogni attimo dell’esecuzione ..insomma un free che ben si inserisce nella personalità di Norberto a comporre un puzzle prezioso ed unico. "...Norberto’s album Ascoltabile Piano and Atmospheres was released in 2010 and features 16 tracks of incredible solo piano playing. Piano notes that seem to blend with one another are enhanced by the sustain pedal in the beginning of the first track Ascoltabile Piano. Norberto can play a series of notes together cleanly, in rhythm and with amazing control. You can definitely hear Monk’s influence on his piano playing. You can hear fourth chords at the beginning before themomentum builds up. Low bass notes add a resonance of sound. Dazzling runs are played on the piano. You can hear strong jazz harmony in the left hand. The tempo speeds up as the harmonies blend together with the sustain pedal. A constant motif is heard in the right hand at times. An exciting broken chord starts the fourth track The Real Illusion. Spectacular runs are played with feeling as you can tell that Norberto is expressing the music. Use of the bass notes in the chords add support to the flexible right hand notes. This tune feels very heart felt throughout. Incredible melodic inventiveness is heard in the right hand. The dynamics are heard well with soft notes heard on the ascending runs. Every tone is rich and is a treasure to the ears. You experience a floating feel at the beginning of the eighth track The Lake Atmosphere. When you listen to this tune, you can tell that careful attention is paid to the notes and phrases, that produces a tranquil atmosphere. This tune has a haunting, peaceful quality when you listen to the dark harmonies. The runs in the right hand are never forced and always feel musical. Space between the notes creates suspense and you wonder what you will hear next. Towards the end you hear the tonality switching to major for a short moment. A thoughtful sound fills your ears when you listen to the eleventh track Dawn Atmosphere. Runs that begin in the low bass adds an astounding full sound to this tune. A terrific ascending run is heard that reaches to the very top. The direction of the notes have a tendency to reach upward, creating a brilliant ladder of sound. He allows time between the notes that lets your musical imagination flourish. You can hear impressive descending runs in the right hand. A series of notes that are alive with vigor is heard at the beginning of the fourteenth track The London Trip Atmosphere. A strong downbeat in the low bass is played with force and authority. Wonderful notes are played in the right hand that have amazing creativity. Repeated notes are heard in the right hand while a series of left hand chords add a rhythmic flavor of sound. There is a strong influence of Monk in this tune. The complexity of the whole piece is unbelievable. Notes that are played with much virtuosity in the right hand feature exhilarating speed. sound. The music in this album gives your ears plenty to listen to with its lush harmonies and dazzling runs. He makes the most out of the versatility of the piano. His jazz harmony and improvised runs work together perfectly. Ascoltabile Piano & Atmospheres is a must listen for jazz fans." Pianist Norberto Tamburrino is based in the sunny climes of southern Italy, but his jazz influences come for the most part from the thriving US scene of the 1940s, 1950s and 1960s. He's happy to credit Bud Powell, Hank Jones, Lennie Tristano and Art Tatum as influences, but above all it's the influence of Thelonious Monk that comes across most clearly in Tamburrino's playing. Indeed, his 2009 album Reflection(s) On Monk (Philology Jazz) was clearly influenced by, as well as being a tribute to, the great musician. 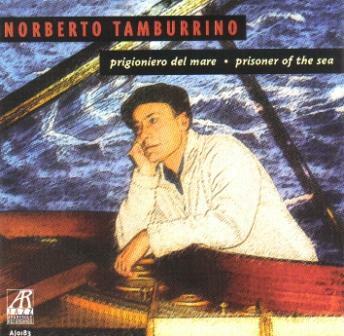 The spirit of Monk pervades Tamburrino's playing again on the two albums reviewed here, but there is too a strongly reflective and personal feel to his work. 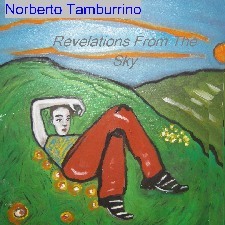 Revelations From The Sky finds Tamburrino playing in solo, trio and quartet formations, exploring a range of moods and tempos. 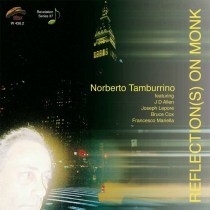 Monk's influence on Tamburrino's playing is most obvious on the opening track, "Revelations From the Sky," which sees the pianist's chordal playing underpinning the tune's dominant musical force, the tenor sax of Roberto Spagnolo, while drummer Marcello Nisi provides a slinky percussive beat. Spagnolo also dominates "Praterie Dell'Infinito," while Tamburrino's own playing is fluid and lyrical and bassist Francesco Mariella adds a strongly-played bass solo. 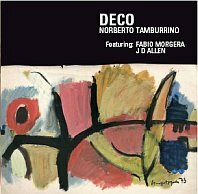 Monk's influence is less obvious here and as the album progresses Tamburrino continues to focus on this more lyrical, smoother stylistic approach. Benny Carter's "When Lights Are Low" is given an intriguing treatment. Initially the Monk influence resurfaces and Tamburrino then alternates between this angular, jagged approach and his more fluid playing across the remainder of the tune. For "Indaffarato," Tamburrino is joined by the rhythm section of Joseph Lepore on bass and Bruce Cox on drums—both musicians played on Reflection(s) On Monk. These experienced musicians bring a strength and confidence to the music that is at times absent from the playing of Nisi and Mariella—as a result Tamburrino's own playing seems stronger and freer, creating the most complete tune on the album. The final three tunes are solo piano pieces. "Felinity" is another tune characterized by angular playing and rhythmical changes, "Some Brilliant Shadows" has a lovely, delicate melody and "The Son(g) is Born" is a slow and beautiful ballad which sees Tamburrino in a particularly reflective and gentle mood. Ascoltabile Piano And Atmospheres was recorded in Taranto, Italy, between December 2007 and December 2009 and showcases Tamburrino's solo piano—with the exception of one track, "Is Atlantis On The Sky?," which features multi-tracked electric piano and keyboards. The first seven tunes are compositions, while the remainder are improvised pieces which Tamburrino refers to as "Atmospheres." The distinction between the composed and improvised pieces is not always clear. "Ascoltabile Piano," for example, is composed but its abrupt ending gives it the feel of an improvised piece, while the structure of "Mad Wars Atmosphere" makes it sound more like a composed tune. This lack of distinction is more of an academic issue than an aesthetic one, for it makes no difference to the experience of hearing the performances. The multi-tracking on "Is Atlantis On The Sky?" gives the tune an ethereal choral feel, but the overall effect tends to overwhelm the central theme of the tune, played on electric piano. 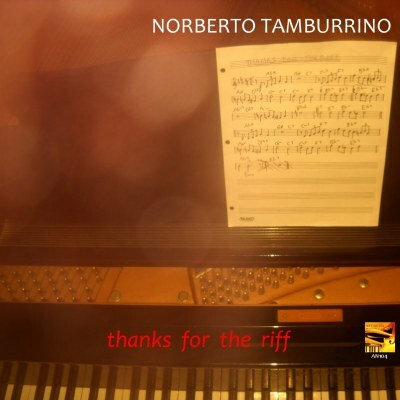 The solo piano tunes, whether composed or improvised, are much more successful; Tamburrino connects effectively with the acoustic instrument, producing attractive, thoughtful performances across a series of brief and reflective pieces. The overarching impact of Ascoltabile Piano And Atmospheres is a gentle one. The variations in tempo and mood to be found on Revelations From The Sky are absent here and the result is a far more consistent experience. 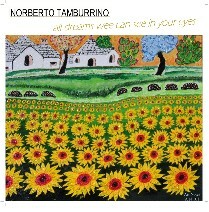 Tamburrino's playing is emotive and thoughtful, and the tunes fit together to create a quietly contemplative album. "..Sicuramente un lavoro riuscito che rappresenta un tassello importante nella discografia del pianista pugliese in una dimensione in cui a venir fuori è proprio il gusto e fraseggio di Tamburrino, che si conferma un artista completo. "..The fires of musical energy are felt in this album that translates into a musical delight for the listener. 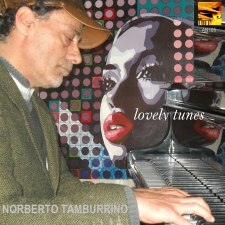 Norberto projects true love for jazz music through his playing and has the right touch for jazz piano. Reflections(S) On Monk needs to be in your jazz CD collection." “...più che le strutture, per Tamburrino sembrano avere importanza il lirismo di Thelonious e il modo in cui, per un processo di assimilazione, è diventato un naturale elemento della sua poetica. E sta proprio in questo il punto di forza del disco. “.. In trio, Tamburrino miscela le raffinatezze armoniche di Bill Evans con le asperità di T. Monk ottenendo un risultato interessante grazie anche all’ottimo interplay con la ritmica americana e alla completa padronanza degli ottantotto tasti. “.. I must say that already after listening to the first album, certain of Tamburrino's characteristics had hit me, characteristics that I found amplified in the new album which I don't hesitate to define excellent, and for more than one reason. Most of all, the artist from Puglia shows that he's a well-rounded musician which makes one praise him under different aspects, principally as a composer. As already mentioned, almost all of the pieces are his and in writing them the artist demonstrates a very pleasant quality, with elements of suggestive introspection which are found everywhere. Particularly interesting, in this regard, Ocean View and Tramonti di Pioggia (Sunsets of Rain), whereas Prisoner of the Sea brings us into a mainstream territory presented however with originality and thoughtfulness. Originality and thoughtfulness which we find in Tamburrino's execution, who boasts of a solid base preparation, a light touch but always swinging, a great facility for improvisation and a particular harmonic richness. Starting with these premises, you will already have understood that the album is listened to with great interest from the first note also because, for once, the material isn't "treated" but we hear it as we would hear it live, except for Stars in Box in which Tamburrino's piano is heard over a pre-registered base, composed of organ, koto, violins and an electric piano. "...Tamburrino's piano playing, heavily influenced by Thelonious Monk, is ripe with percussive clatter and arpeggiated flourishes. Indeed, the inclusion of Monk's overlooked ballad "We See" demonstrates Tamburrino's thorough understanding of the familiar nuances associated with the late pianist..."
"E' personaggio interessante, questo pianista della nuova onda di jazzisti pugliesi che si divide tra movenze classicheggianti e zone franche alla maniera Westoniana, cui aggiunge masticate traiettorie vicine all'inevitabile Thelonious Monk....Piacciono l'orientaleggiante "Come Mai" con la tromba sordinata di Fabio Morgera e il bellisimo assolo di sax di J. D. Allen " in Roxane". La gran parte del cd lo vede però in solitudine al piano, pulito, intenso, attento e spaziale.."
“ Per fortuna il jazz italiano continua a percorrere numerose direzioni ed è sempre più semplice aver la possibilità di ascoltare qualcosa che sia non necessariamente consuetudine. Norberto Tamburrino realizza con questo lavoro un progetto non facile di integrazione per diversi percorsi sonori che lo riguardano"....… insomma, un discreto campionario di situazioni ,generi e stili che lascia intuire da subito un ambito d’ascolto piuttosto variegato. I rimandi a Monk, nello stile, nella musicalità, nel tocco, nell’improvvisazione come nelle scelte compositive, è evidente ben oltre l’omaggio che al grande musicista viene reso da Tamburrino con We See, mentre il resto delle composizioni è praticamente per intero opera del titolare del lavoro..”.